e-book India 2017 Yearbook Rajiv Mehrishi in PDF: Rajiv Mehrishi, the Comptroller and Auditor General of India(CAG) and former Union home secretary, has authored an e-book titled “India 2017 Yearbook” on current affairs in India. It is recently launched by Rajasthan Chief Minister Vasundhara Raje in Jaipur. The e-book includes a plethora of information on important dignitaries, state policy, public schemes and important data about demographics, trade, economy and many other topics. India 2017 falls under the yearbook/reference segment and is an absolute must for all students preparing for the UPSC / State Civil Service or other competitive examinations in India. 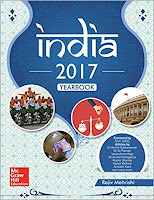 The yearbook is an authoritative compilation by Shri Rajiv Mehrishi, the incumbent Union Home Secretary, on various issues that are regularly queried in various competitive examinations, including political and economic policy, public schemes, international relations, current affairs and important data related to demographics, trade, economy and others. India 2017 Yearbook Rajiv Mehrishi e-Book is Not FREE, You have to Buy it ONLINE.